Over the past five years, Emory's research funding has shown a 51.2 percent increase. Enlarge/download chart. Scientists at Emory University received $535.1 million from external funding agencies in fiscal year 2010 – an increase of 10.5 percent over fiscal year 2009. Research funding in Emory’s Woodruff Health Sciences Center (WHSC) was $500.7 million. The WHSC includes schools of medicine, public health, nursing, Yerkes National Primate Research Center, Winship Cancer Institute and Emory Healthcare. More than 74 percent of the funds, or $396.5 million, were awarded by federal agencies, led by the National Institutes of Health with $350.5 million. 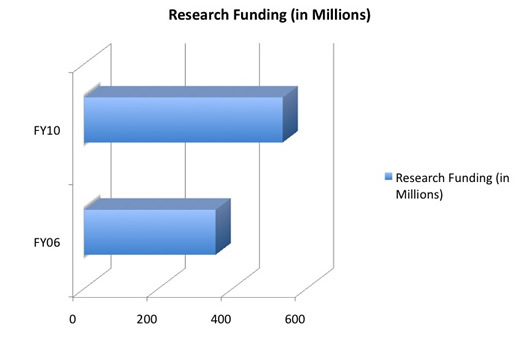 NIH funding increased by 17.4 percent over FY09 and represented 88.4 percent of total federal dollars awarded to Emory and more than 65 percent of all funding received. Over the past five years, Emory’s research funding has grown from $353.9 million in FY06 to $535.1 million in FY10, representing a 51.2 percent increase. Emory University School of Medicine received $347.7 million, for approximately 65 percent of the total dollars awarded and an 8.1 percent increase from FY09. The Yerkes National Primate Research Center received $78.3 million—an increase of 37 percent from FY09. The Rollins School of Public Health received $63.9 million, or an increase of 6.5 percent. The Nell Hodgson Woodruff School of Nursing received $7.3 million, or an increase of 208 percent from FY09. Of the total funds awarded, $90.4 million were awarded from federal funds through the American Recovery and Reinvestment Act (ARRA). $15.5 million for a Center for Systems Vaccinology to the Emory Vaccine Center at Yerkes National Primate Research Center. Scientists will use the five-year grant from the NIH National Institute of Allergy and Infectious Diseases to study human immune responses to vaccination and work to improve vaccine development, using the modern analytic tools of systems biology. $8 million to the Alzheimer’s Disease Research Center in a renewal of the center’s designation as one of 30 Alzheimer’s Disease Research Centers in the United States and the only one in Georgia. The five-year grant from the NIH National Institute on Aging signifies the highest status an institution can receive in Alzheimer’s disease research and care. $8.2 million to the School of Nursing for a project to improve maternal and newborn survival rates in rural Ethiopia. The two-and-a-half-year grant is from the Bill & Melinda Gates Foundation. $3 million to the Department of Pediatrics in Emory School of Medicine from the Zeist Foundation. This five-year grant will help pediatricians improve outcomes for at-risk children in metro Atlanta and throughout Georgia and will fund development of an urban health program. $4.7 million to the Winship Cancer Institute from an anonymous donor to fund research priorities including faculty recruitment, seed grants and investigator-initiated clinical trials. $6.2 million to the Emory Prevention Research Center from the Centers for Disease Control and Prevention (CDC). The grant will allow the center, housed at the Rollins School of Public Health, to continue its mission to prevent cancer and reduce health disparities among residents of rural southwest Georgia. $500,000 from the National Science Foundation to a biologist to further research into whether monarch butterflies can cure themselves and their offspring of disease using medicinal plants. $3.4 million for Emory and its partners to create an international genomics database from patients with autism and other developmental disorders. $1 million to Emory and partners at Georgia Tech and Children’s Healthcare of Atlanta to develop dialysis equipment tailored specifically to children. $2.37 million to test growth factors that can prod bone marrow cells into the bloodstream to repair blood vessels in the legs and treat peripheral artery disease. $775,000 to study nuclear organization in stem and differentiated cells. $1 million to explore new microarray-based tools to detect genetic variants in muscular dystrophies. $1.5 million to increase accessibility and use of high-level informatics and DNA sequencing through cloud computing. $772,650 to design new treatment agents for drug abuse. $3.7 million to study and improve vaccine-induced immunity in the young and the aged. $1.7 million to develop better drug strategies for pediatric transplant patients.